Many of you will know Terry Doyle. 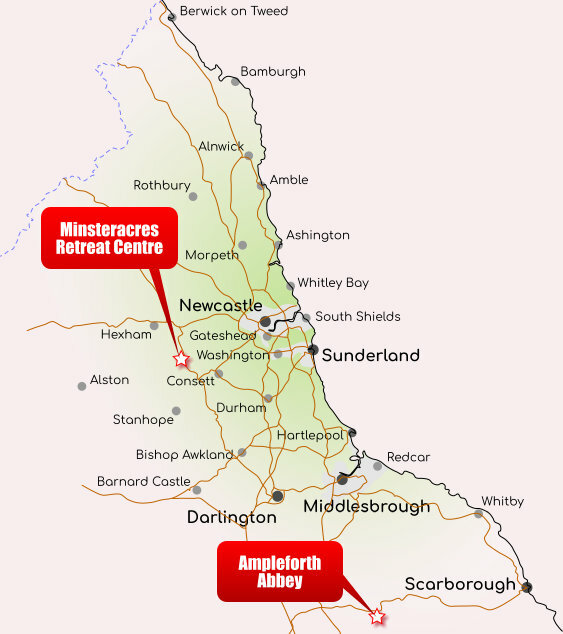 This year he is offering four weekend retreats at Minsteracres Retreat Centre near Consett and Ampleforth Abbey between York and Scarborough. An opportunity has opened up in Middlesbrough which you might be interested in, too. Tai Chi has been described as ‘meditation in movement’. Christian Meditation involves stillness. During this retreat we balance these paradoxical practices to help focus our body and mind on being open to God. Under Terry Doyle, a practitioner of Tai Chi and an Oblate of the World Community of Christian Meditation (WCCM) we will be guided in our learning and develop these means, by which we relax and become aware of God’s presence. No previous experience is required, but those who have been before are most welcome to renew their practise and re-connect. Terry will explore how the practice of meditation can also be encountered through the language of the body using breathing exercises, gentle stretching and slow Tai Chi movements to complement the seated meditation periods. Suitable for all ages and abilities. Please wear loose clothing. Terry Doyle is a Benedictine Oblate with the World Community for Christian Meditation (WCCM), and a founder member of Jason Chan's Light Foundation. He is an experienced workshop and retreat leader who also works in the area of homelessness, addiction and social justice. This weekend welcomes new people to the practice of Meditation, and people who have been before, but who want a meditative weekend of Silent learning. Terry Doyle, an Oblate of the World Community of Christian Meditation, will conduct the silent weekend, through the teachings of John Main and Laurence Freeman, and periods of Meditation practice. Fr Christopher will accompany the sessions, and contribute some input from the Rule of Benedict. The Retreat is integrated with the Community Prayer in the Abbey Church, as well as time for quiet walks or time on your own. Meditatio are offering an opportunity for service, working among the marginalised in Middlesborough. They are partnering with the Catholic Diocese of Middlesbrough to offer a very exciting Volunteering opportunity for 3 people from our meditation community to spend some time living and working from the John Paul Centre there. For more details, see Leonardo Correa's post on Meditatio's Social Justice blog. If this email has only text (no pictures or headings) please see the full version at http://www.christian-meditation-ne.uk/events.html.